Humans forget things, so maybe you've forgotten your Sunlight password. But don't worry, follow these simple steps to get it back. To reset your password, simply visit our Sign In page, and click on the "Forgot your password" option at the bottom of the page (It's the second option from left to right). 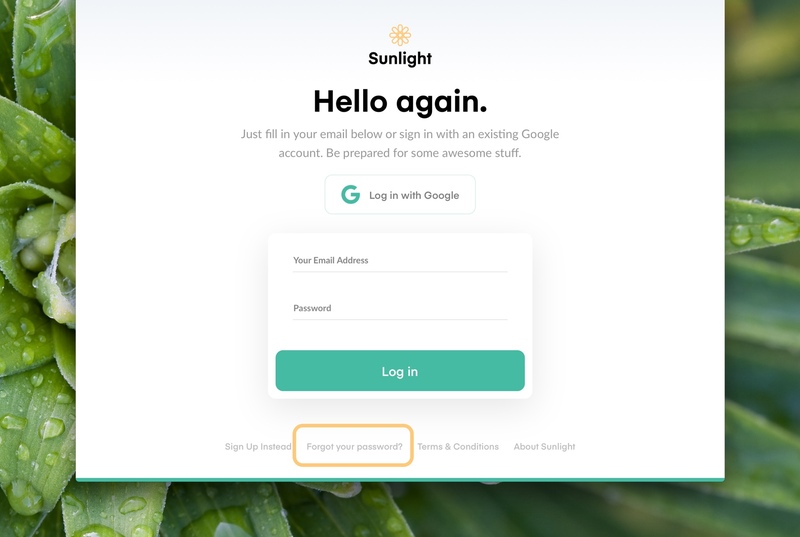 This will redirect you to a password recovery page, where you'll have to enter the email you first used to open your Sunlight account. After you're done, just click on "Let's go!" You'll receive an email shortly with a link to reset your password, which will take you to a page. Simply enter your new password twice and you'll be ready to go! If you have any questions or comments, please don’t hesitate to reach out to our support team via our Concierge or at support@sunlight.is.